This month we are delighted to have David Gilday as our guest speaker. David's day job is as principal engineer at ARM Ltd, designing the chips that power the world's smart phones and of course our favourite OS. 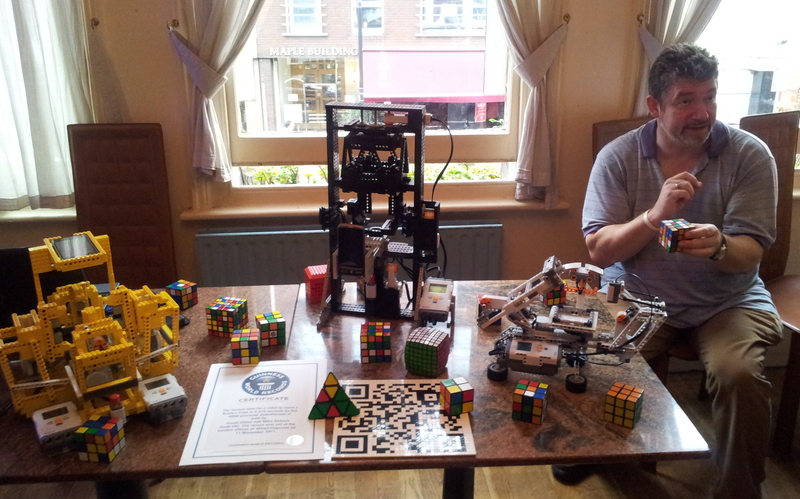 As if that wasn't exciting enough, in his spare time he creates robots using Lego that can solve the Rubik's Cube! The robots are built using standard Lego sets and Mindstorms motors, controlled by an Android mobile phone (ARM powered obviously) running David's software to analyse the cube and compute the most efficient moves to solve it. The most sophisticated, the CubeStormerII built with Mike Dobson, holds the world record for solving the standard cube in 5.2s, surpassing even the fastest human. Other versions exist to solve cubes from the usual 3x3x3 all the way upto 7x7x7, with varying degrees of speed and complexity. David will be bringing several of these robots along to ROUGOL to show them in action, describing how they work and some of the practical issues around manipulating the Rubik's cube, including why the 7x7x7 cube isn't actually a cube at all. Video of the Speedcuber in action: High quality AVI and RiscPC friendly MPEG.